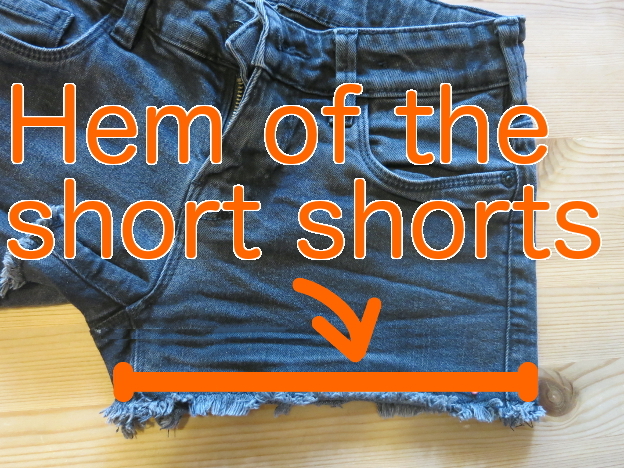 Do you have a pair of shorts that are a bit too short to wear comfortably? 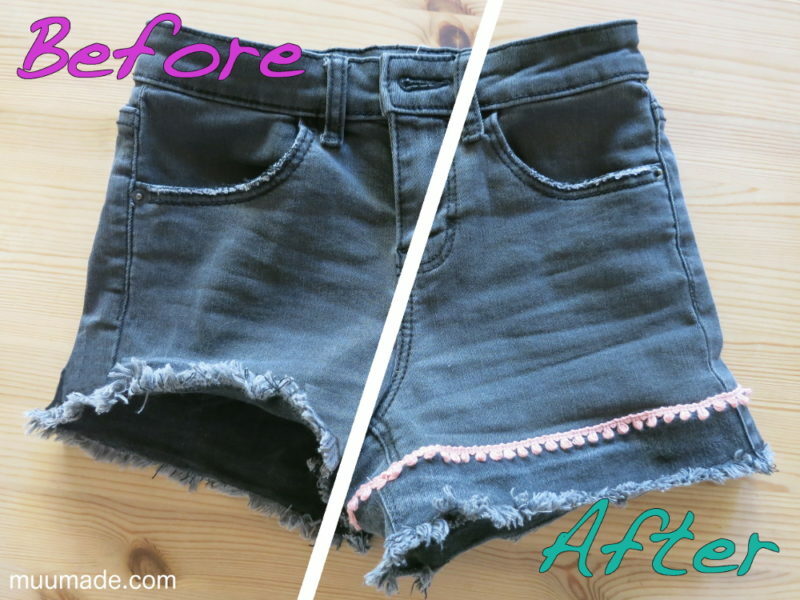 Well, here is a way to make your shorts less short! 1. 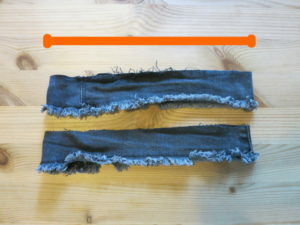 From a pair of old pants or shorts, cut out two extension pieces that are the same width as the hems of the shorts that are too short (the width is indicated by the orange lines in the photos on the left). If your extensions already have finished hems, or if you want to make shorts with frayed hems, cut the extensions to the length that you wish to add to the shorts. 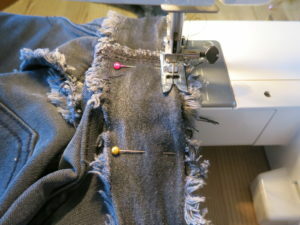 Click here to learn how to fray the hems. 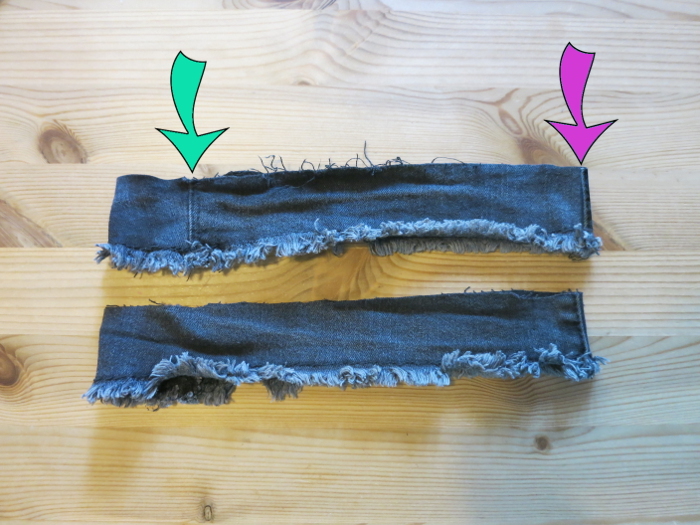 If the hems of the extensions are not finished, and you want to make sewn hems, make the extensions approximately 4 cm (1 1/2″) longer than the desired length. 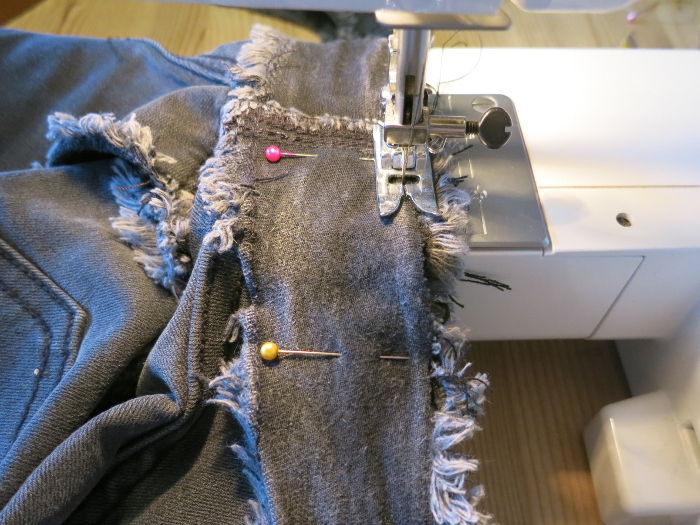 Click here to learn how to sew the hems. 2. Each extension piece has two seams. 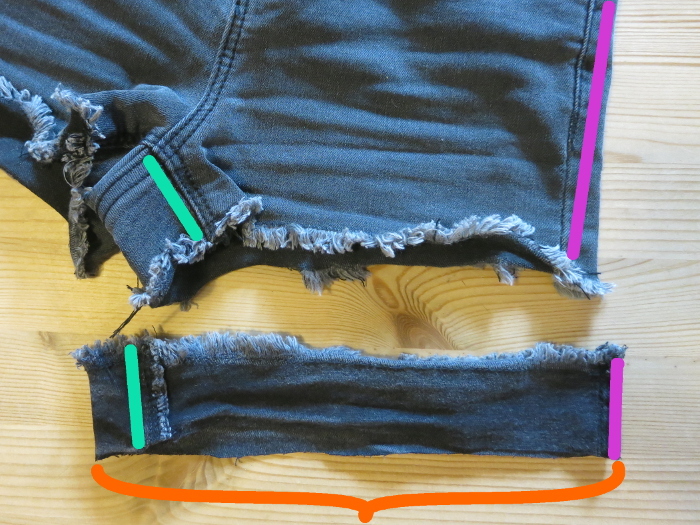 The green arrow in the photo on the left indicates the inner thigh seam, and the pink arrow the outer seam. 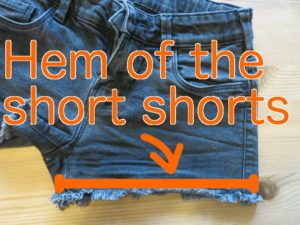 Keep this distinction in mind when attaching the extensions to the shorts. Turn the extensions inside out. 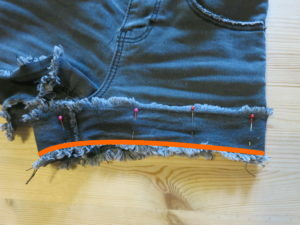 In the second photo on the left, the bottom edge (indicated in orange) is the edge that will be sewn to the hem of the shorts. Place one of the extensions next to one of the legs of the shorts, as shown in the first photo on the left. 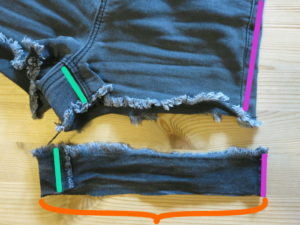 Note that the edge to be sewn (indicated in orange) of the extension piece is facing away from the shorts, and the inner (green) and outer (pink) seams of the extension are aligned with those of the shorts. Then, as shown in the second photo, slide the extension onto the leg of the shorts, align the edges to be sewn (indicated in orange) and the seams, then pin them together. 4. 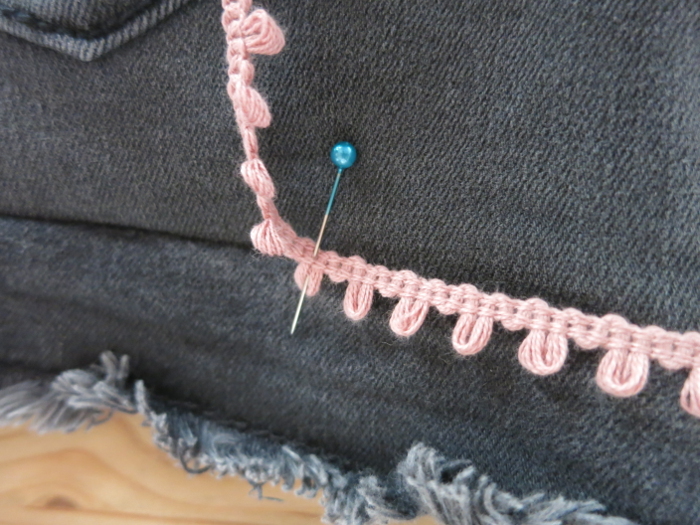 Using a sewing machine (with straight stitches), sew along the edge all the way around the thigh. 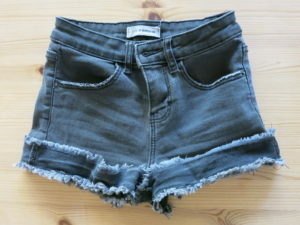 Repeat with the other leg of the shorts. 5. 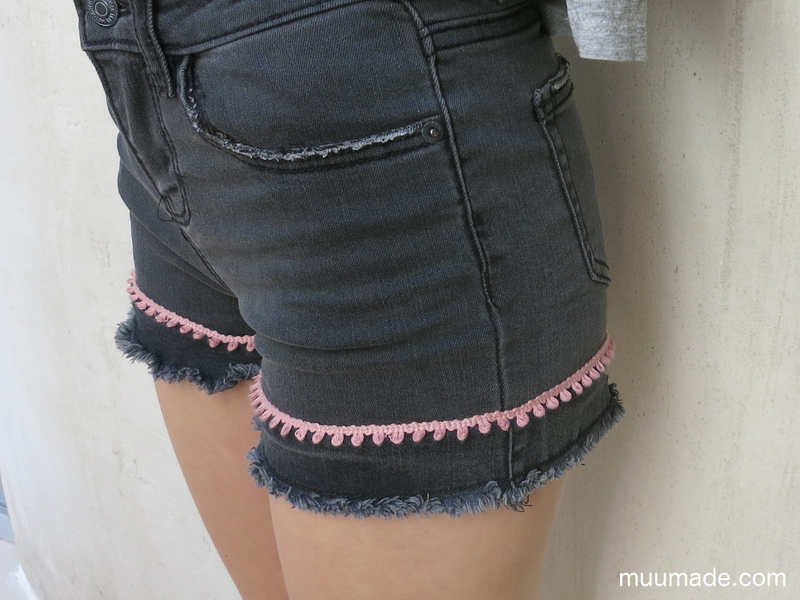 When done sewing both of the extensions onto the shorts, turn the extensions right side out. 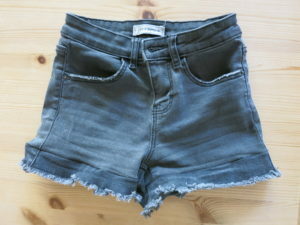 You now have successfully made your shorts less short! 6. (Optional) If you wish to hide the new seam that you just made, you can sew some lace over it to decorate your shorts. 7. Ta-da! 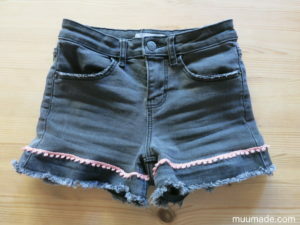 A newly extended pair of shorts! 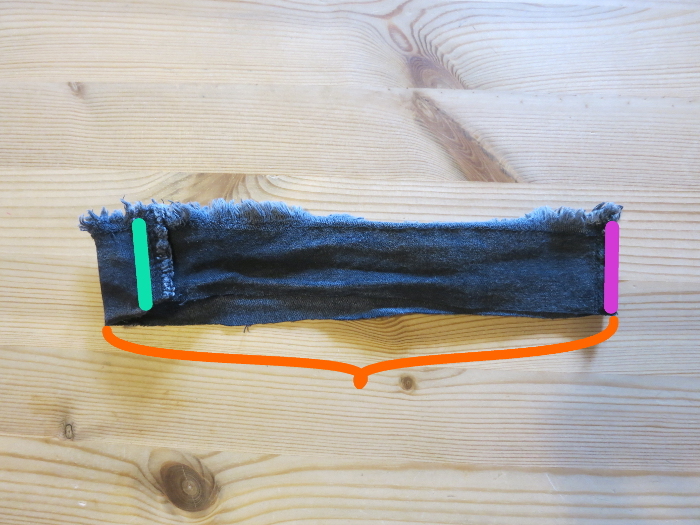 Now your shorts are longer, fancier, and more comfortable!